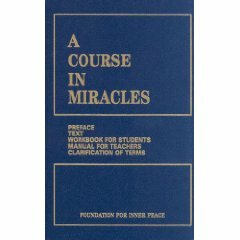 A Course in Miracles was published in 1976 and has since changed the lives of millions of people around the world. It’s a course that helps you practice forgiveness, let go of barriers to love, create greater peace in your world, and change your perceptions so you can more deeply know your own spirit and the spirit of others. What’s at the root of your fears? Why do we feel like we don’t matter? How can you experience joy and love in your relationships? How can you feel safe in this world? The Course has inspired the writing of Marianne Williamson, Wayne Dyer, Deepak Chopra and many others. It’s called “spiritual psychotherapy” because it carries powerful spiritual insights and offers a deep understanding of human emotion and relationships. We’ll study the principles of the Course and how they directly impact your everyday life. I’ve been studying the Course for more than 30 years and facilitating classes in it for more than 15 years. To make the material available to as many people as possible, I lead classes in the Course in several different ways. With each, the focus is on understanding the principles of the Course and applying them to real-life situations. This is not just an intellectual study—it’s designed to help you make real life changes by practicing the Course day to day. Whether you’re new to the Course or you’ve studied it for a while, please join us. I lead classes in my home near Des Moines, Iowa, on Tuesday and Wednesday nights. If you’d like to be part of a class, please contact me, as spaces open up from time to time. Once a month, I present a live teleclass about a specific principle in the Course. This is an excellent opportunity to go in depth about a particular teaching and ask questions, too. The presentations are recorded and made available to everyone who registers. For a full schedule and to register so you’ll receive a reminder about each teleclass, click here. This program is for those who have a specific goal or intention and want to approach it using the transformative principles of the Course. It includes monthly private coaching and small group sessions. You’ll also receive weekly emails, videos and other materials built around six key teachings of the Course. For complete details, click here. And please check out my schedule of events, too, for retreats and workshops that incorporate A Course in Miracles. For information on private coaching based on the teachings of A Course in Miracles, click here. You'll get a free gift, plus inspiration, tips and announcements you don't want to miss.